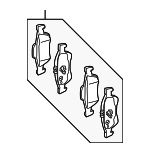 Your brakes function through the careful application of friction. 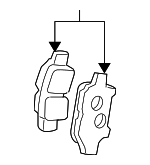 As the brake rotors spin, it is the job of the brake pad to act upon the rotor to slow the piece down, eventually resulting in complete stoppage of the vehicle. Brake pads press against the sides of the rotor, creating friction. These parts will wear down over time and it is crucial to get them replaced when you notice that it's taking a little longer to slow down than normal. Shop our online warehouse to find the right front and rear brake pads for your car, truck, or SUV.